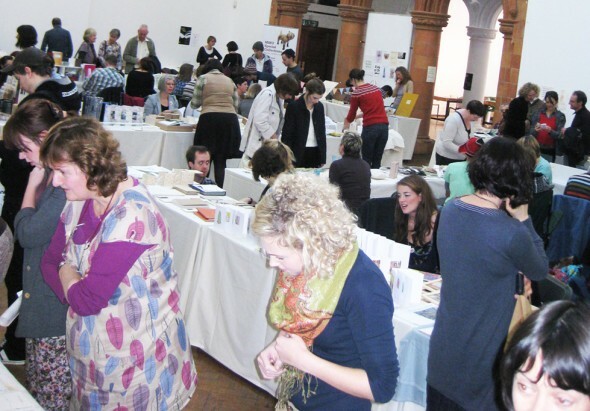 Hot Bed Press are proud to announce that we will once again be organizing the Manchester Artists’ Book Fair to be held at the Holden Gallery, Manchester on Saturday 22nd October 2011, from 11am – 6pm. Last years event saw 43 stands showing artists’ books, zines and the works of small publishers from all around the UK all mingling alongside each other and the many visitors were able to see a performance by Carson & Miller as well as buying beautiful works direct from the artists and makers. This year, the second year Hot Bed Press will be working with MMU to run the event, we aim to make it bigger and better with up to 50 stands including a zine annex off the main hall. There will also be workshops and demonstrations for all to enjoy and participate in. We are keen to build on last year’s endeavours and to hold another fair filled with fantastic book arts and associated events. New in 2011 we are pleased to announce that (MMU) Manchester Metropolitan University Special Collections and The University of Salford School of Art & Design and have teamed up to run a special symposium to coincide with the book fair: Photography & the Artists’ Book will take place on Friday 21st October at Special Collections Gallery at MMU, (across the way from the Holden Gallery), with papers and talks on many aspects of this fascinating genre. Open to all to attend. For more information, please contact Theresa Wilkie. The gallery can accommodate between 40 and 50 tables, available on a first come first served basis. The tables will measure 6’ x 2’3” and be provided with two chairs and a tablecloth. Fixing to the walls is not allowed; it is therefore recommended that if you need extra display systems these are situated on the table tops. If you would like to take part in this year’s fair, the fee is £60, payable in advance. Please download a booking form and send with your remittance to Manchester Artists’ Book Fair, Hot Bed Press, 1st floor Casket Works, Cow Lane, Salford M5 4NB. If you have any further questions then please contact Sean Rorke or Karen Mercer on 0161 743 3111 (from Wednesday afternoon to Friday), or e-mail info@hotbedpress.org with the Subject: Manchester Artists Book Fair. Couldn’t spot the date and times for this – it’s Sat 22nd isn’t it?? Yes Saturday 22nd October. I will make sure it’s amended on the website. Hi, please could you tell me if the friday symposium requires pre-booking or is it simply turn up on the day.? This one day symposium, which precedes the 6th Manchester Artists’ Book Fair, will draw together theorists and practitioners in order to fully explore the issues raised by the relationship of photography and the artist’s book. For further enquiries, please email Theresa Wilkie at Salford School of Art and Design. Tables are booking up steadily for the book fair. All is on target. We still have a few spaces left though, so anyone interested in taking a table at this year’s MABF let us know soon. We expect all 40 tables to be taken in the next few weeks. Just wondering if there might be any tables left?